I’m going to keep this short and sweet. My computer is being completely slow and not acting normal at all. Dana was working on it all evening but no such luck. I still can’t transfer photos from our camera to my computer which is super annoying. Anyway, enough of that rant. Womp womppppp. Lunch was identical to yesterday. I am really loving the pb banana wraps lately. I will try and branch out again soon to keep things interesting. Maybe. After work I headed to the gym and ran/walked for 15 minutes on the treadmill, ellipticaled(??!) for 10 minutes, headed to the weights to work on triceps and chest, hopped back on the treadmill to walk it off for 5 more minutes. Then to the mats to work on some abs with the 6 lb medicine ball. Some days I challenge myself with the 8 lb-er and I’m thinking I should really start doing that more often than the 6 lb ball. Dinner tonight involved no chopping, cooking, or cleaning. Only a trip down the road to Subway. Dana and I split a $5 footlong. Did you know it’s FebruAny and you can get any foot long sub for FIVE DOLLARS? What a steal, right? We got turkey on 9-grain honey oat bread, pepper jack cheese, loaded veggies, and honey mustard sauce. Dana got wasabi sauce on his half which is a little too spicy for me. Dinner really hit the spot and it was a nice break from the norm. Like I said, I’m going to keep this short and sweet. I am so frustrated with my computer I can just feel my blood pressure rising. I’m hoping to be back up and running soon. I will keep posting as often as I can. Keep readin! 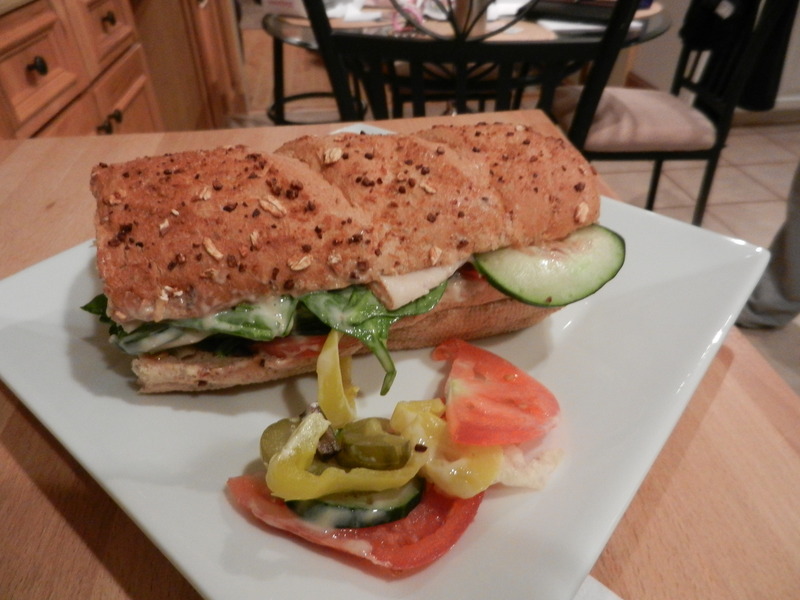 This entry was posted in Dinners, Sweet Treats and tagged Restaurants, subway, Workouts by Melanie. Bookmark the permalink.